The wonderful Paul Zenon sprinkled his fairy dust over the Forest of Thoughts, amazing people with fantastic tricks. He’s now off in Edinburgh, and has used his magical powers to persuade Paul Daniels to do a chat show with him on Monday afternoon as a fundraiser for the Wonderbus (a wonderful charity that I strongly urge you to support) It’s a last minute thing so they’ve got no publicity out. As such, if you’re in Edinburgh, go, and if you’re not, please pass the word to anyone you know in Edinburgh. 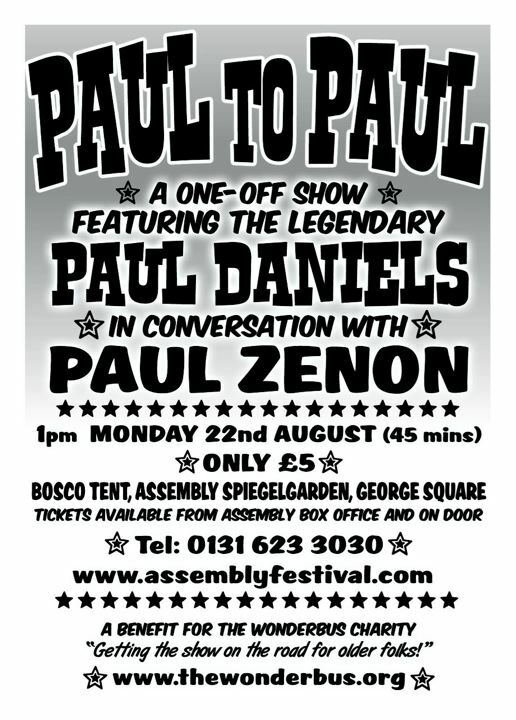 The show is called Paul to Paul and will be at 1pm in the Bosco Tent in the Assembly Spiegelgarden in George Square. Tickets cost a measly £5 from the box office (0131 473 2000).